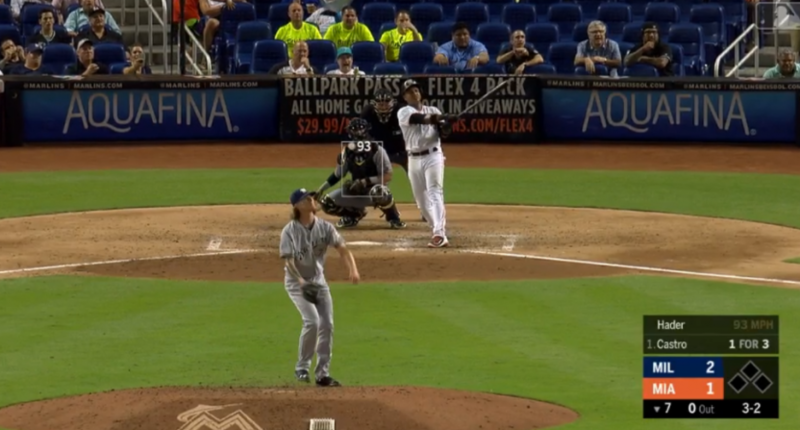 Starlin Castro and Brian Anderson homered on back-to-back pitches from Hader Monday. Milwaukee Brewers’ reliever Josh Hader has had a great season so far, posting a 1.21 ERA and just two home runs allowed in 44.2 innings of work heading into Monday and earning an All-Star selection this weekend. But when Hader came in with a 2-1 lead in the bottom of the seventh against the Miami Marlins Monday night, things didn’t go so well for him. Starlin sends one to left. TIE BALLGAME. Holy F!! Hader is SO OVER @brewers!! U have got 2 be kidding me!! An All Star??? NO!! Hader’s ERA only jumped to 1.58 with these two home runs, which is still pretty amazing. And he got out of the inning without further damage, and recorded the first two outs of a second inning without allowing a further run (although he did concede a single and a walk, and had both a trainer visit to the mound and a regular visit to the mound). So he’s still pretty good, regardless of what Kaelin thinks. But the Marlins sure got to him in those two at-bats.